The evolution of telecommunications since the 19th century to its current, sophisticated and versatile format, has forever changed the way in which human beings interact. Our ability to communicate electronically and digitally from anywhere in the world has created a range of new opportunities and expanded trade. In the last decade or so, a technology called VoIP (Voice over Internet Protocol) has increased in popularity. VoIP goes by a few different names including internet telephony, broadband phone and Voice over Broadband (VoBB). In essence it’s the transmission of voice data from one IP address to another. VoIP was created in 1995 to deal with the issue of expensive long-distance calls, and today it is regarded as a cost effective alternative (and superior offering) to traditional land-line phone systems. With all that happening, it is little wonder the tech junior raised A$6 million recently. This company has designed its own feature-rich VoIP private branch exchange (PBX) system which it sells direct to small and medium-sized enterprise (SME) customers, as well as through white label agreements with bigger telcos. Its VoIP PBX is its bread and butter, but the company also has a retail business which sells the full spectrum of telecom services, plus a software engineering development hub working on cutting edge telecommunications solutions with mass market appeal. Soon, it will be launching its long-awaited social media aggregator app, the Oper8tor. This small cap is underpinned by a highly scalable business model, with its retail division earning $6.12 million in revenue in 2017 and its wholesale division logging $1.16 million. In fact, its revenues have grown by approximately 20% each year since 2014. This tech play also has an excellent market opportunity waiting for it post-listing — the nationwide rollout of the NBN. Over the next three years, all internet users in Australia will be required to migrate over to the NBN, in what’s referred to as a ‘forced churn event’. Importantly, during the transition new customers are up for grabs. Millions of customers will be on the hunt for the best NBN package they can get, posing a unique hustling opportunity for up-and-coming telcos like today’s company. Since all NBN providers will have access to the same network, the competitive edge will come from factors like lower prices, more features and greater flexibility — all of which this company is in an excellent position to offer. Because this play actually makes the technology it sells, it can offer more to the customer, and for a lower cost than most competitors who need to fork out for licensing of another company’s technology. Being in control of the tech also means being able to release features easily for customers as soon as they’re ready. 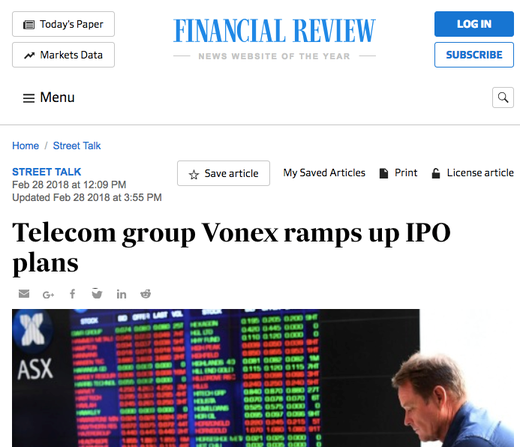 Established in 2009, Vonex Limited (ASX:VN8) now seems to be growing into a formidable telco operating in the SME space. 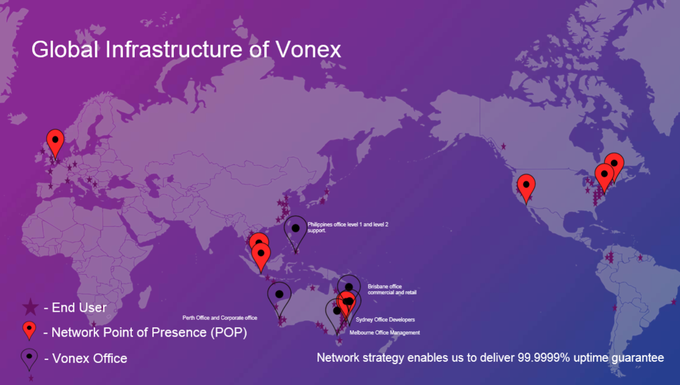 Vonex Wholesale — where its voice, VoIP, PBX and advanced features tech is sold on a white label basis to clients (other telcos etc. ), and subsequently on-sold under their own brand. 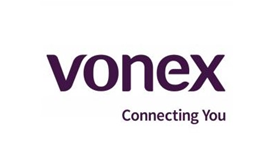 Vonex Telecom (Retail) — where it provides a full telecommunication service offering across mobile, internet, business phone systems and hosted PBX, sold direct through VN8 or via affiliates (Channel Partners). Development and engineering — where Vonex does what it has always done best: software engineering and tech development. It’s this division that maintains and develops products to keep VN8 at the forefront of advancements in the market. Through its listing on the ASX today, VN8 has raised a crucial $6 million to take it over the line with several of its ambitions. The capital should give it a head start in its plans for continued development of its world-first telecommunication applications aggregator Oper8tor — due for launch later this year — plus its marketing activities around promoting its PBX solutions to SMEs (retail and wholesale). 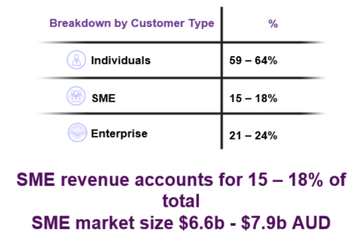 The size of the SME telecom market that VN8 is hoping to capture is A$6.6 - A$7.9 billion. Being so far along the path in terms of revenues, customer base, tech development, and with a diversified business strategy, its ASX listing certainly hasn’t flown under the radar. Let’s take a more in-depth look at why VN8 poses such a disruptive threat to the Australian telecom landscape. At the heart of what this solid small cap has to offer is its PBX technology or, private branch exchange. In the case of VN8’s setup, it offers its own VoIP PBX system, providing businesses with a phone system that uses the internet as opposed to the traditional circuit-switched tangible network that’s built into an office. A VoIP PBX means a company can have its own sophisticated telephony system that does not rely on a physical, central box in the building to which all the phones are connected, but a collection of devices that can talk to each other via the company’s existing internet connection through a cloud-based system. In other words, this is taking the ‘brain’ of the so-called landline phone network, and replacing it with a more virtual system stored in a ‘cloud’ via the internet. This achieves a few things, including making the system less expensive, more reliable and feature-rich. This is part of the overall disruption of tech across so many industries that sees a lot of physical hardware made redundant as it’s replaced by more efficient software-based systems. In VN8’s case, it is the ‘virtualisation’ of the traditional business phone system. VN8 stands out from the crowd because it offers feature-rich solutions and affordability at the same time. Its PBX system has 132 advanced features available, including being able to make calls via the same internal phone system (i.e. an extension number) across countries, the ability to ‘push’ a phone call that began on a desk phone to a mobile phone with the push of a button, arranging for multiple numbers to all go to the same handset, getting voicemail sent as email and so on. The ongoing National Broadband Network roll out across Australia poses an excellent opportunity for VN8 to list while its market is hot and customers are comparing internet providers. These customers are primarily SME’s looking for a sophisticated but affordable telecom option. It’s all good timing for VN8, considering the volume of users likely to use the forced NBN churn event as a chance to reassess their provider, and consider their options. The roll out of the NBN drastically widens the scope of how many customers VN8 could capture during the next three years as the country transitions from the old copper systems to modernised broadband. VN8 seem intent on maximising on the opportunity. 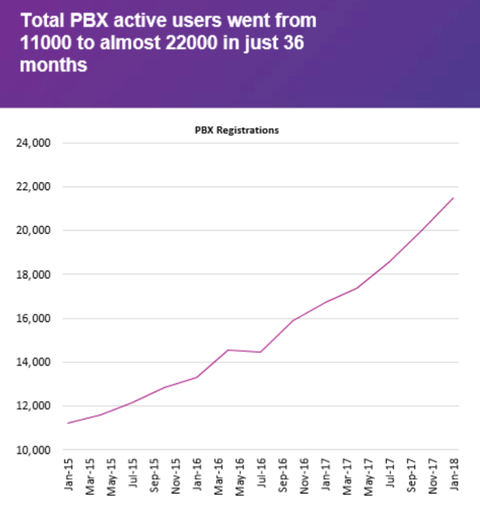 Yet it’s not just NBN packages it’s selling, nor its proprietary software products — in particular its PBX offerings. 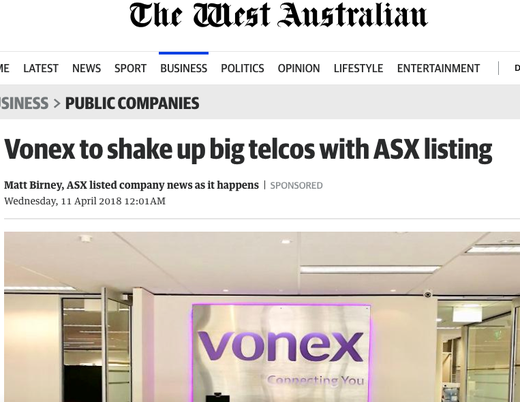 This is a company that sells a range of telecommunications products such as mobile and home phone packages, direct to customers as part of its Vonex Telecom division. VN8 has already made impressive inroads in selling into the SME market via its channel partners who are putting the brand and its product suite in front of as many prospective customers as possible. 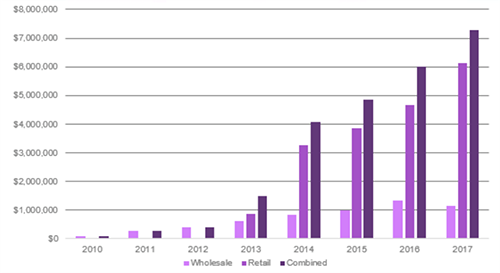 There are several hundred channel reseller partners, in all major capital cities, so it’s no wonder VN8’s retail division is doing very well indeed. At present, VN8 boasts 23,000 users, with sales expected to reach $8 million this financial year. From early on, VN8 has had a simple goal: to develop better telecommunications solutions, with a focus on SMEs that are overwhelmed by the big costs of major providers, but also underserved. The company has landed on its feet in the world of business telephony solutions, with its cloud-based VoIP PBX software. VN8 can compete here because it develops software in-house. For the end customer it cuts out the ‘middle man’, and ensures that new features and solutions are readily available. The advantages for the customer are obvious. And from a shareholder’s perspective, VN8’s model means higher margins. Add to that its smart, multi-pronged sales strategy — selling its own product directly to customer, selling its tech to other telcos via white labelling, and selling the products of other telcos through its retail division — and you’ve got a winning set-up. That’s well and good, but we can’t help but wonder if its software engineering division is where its serious potential lies. It’s powered by an in-house platform the company has developed called the ‘Oper8tor Switchboard’ — which has been designed particularly for its much-awaited Oper8tor phone app, due for beta release in the second half of this year. The company has white labelled the product (now being used under a variety of brands) enabling VN8 to capture new users requiring more specialist applications via its wholesale business. But the Chrome Phone was only scratching the surface. Some fascinating tech now in the works is a platform called LiveScribe, which VN8 has made available to the open source community via Github. LiveScribe enables real-time in-call speech-to-text and text-to-speech capabilities, utilising the latest in speech recognition and artificial intelligence (in particular, Google’s developments in this space) to provide users with live call transcription and a user-friendly speech to text engine. VN8’s LiveScribe could represent game-changing technology for people attempting to communicate across barriers, including language barriers as well as hearing impairments. According to the World Health Organisation there are over 360 million hearing impaired people worldwide, and that’s just one group who could benefit enormously from LiveScribe. As well as real time transcription and translation services for conference calls, the platform also enables post-transcription language translation, so that colleagues or stakeholders can ‘catch up’ on the call easily and quickly. The platform is fit to support Google Cloud’s speech-to-text capabilities — arguably the best of its kind available on the market. These are solutions that are highly practical, and therefore attractive to companies, particularly if they don’t cost the Earth. Yet, as far as VN8’s innovations go, we have left the best till last. Looming large on VN8’s 2018 calendar is the launch of its Oper8tor mobile phone app. Oper8tor allows the user to have a voice conversation with people anywhere, across different social media platforms. The finished product will also do cross-platform messaging, but the key functionality is the cross-platform voice calls which will be enabled between Facebook, Google Hangouts, Skype, Viber, WhatsApp, WeChat, Line and others. It’s the first app of its kind in the world, and as such is protected by a patent. VN8 currently has Oper8tor in the alpha stage — however a good chunk of the funding from its recent capital raise will go towards progressing Oper8tor through the crucial beta stage. The company already has 70,000 people registered to try out Oper8tor once it's in the beta stage, with a soft release pegged for the end of the year. The app syncs a user’s friends contact details from apps and contacts lists, and also updates simultaneously as their friends make any contact detail updates across any of the platforms. 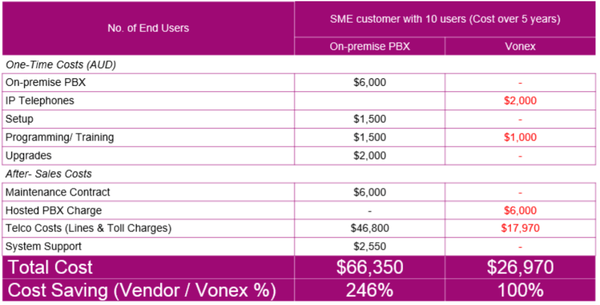 Having just listed on the ASX, and with prospects for three different and unique revenue streams — cloud PBX and billing (Direct and Wholesale), Vonex Telecom (Retail) and its upcoming Oper8tor platform — it’s easy to see VN8 reaching its $8 million sales target for this fiscal year. With demonstrated year-on-year revenue growth, that’s soon to be sustained further by a new product (with more proprietary technologies to come from its development division), we can’t see much wrong with this story. You don’t have to look far for examples of nimble tech teams who, with good fortune and skill, find themselves in the right place at the right time then quickly evolve from small time players to ASX mainstays. If all goes to plan, VN8 could be next.